the poorest countries on Earth at that time. 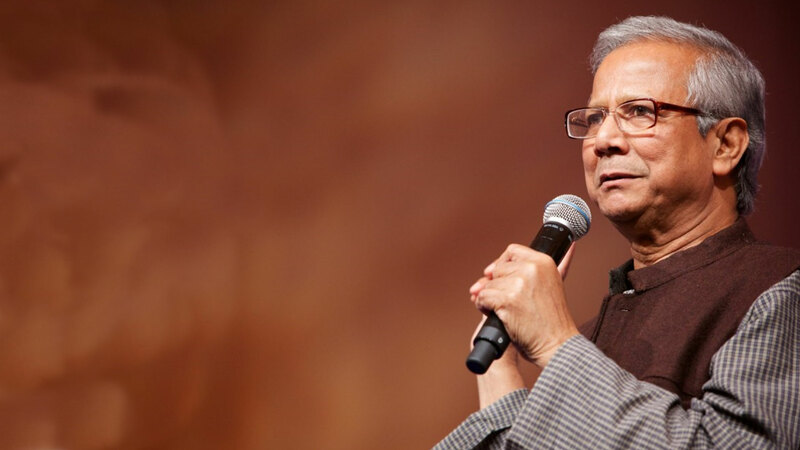 Born in 1940 in the seaport city of Chittagong, Professor Yunus studied at Dhaka University in Bangladesh, then received a Fulbright scholarship to study economics at Vanderbilt University. He received his Ph.D. in economics from Vanderbilt in 1969 and the following year became an assistant professor of economics at Middle Tennessee State University. Returning to Bangladesh, Yunus headed the economics department at Chittagong University. Banker to the Poor, Professor Muhammad Yunus established the Grameen Bank in Bangladesh in 1983, fueled by the belief that credit is a fundamental human right. His objective was to help poor people escape from poverty by providing loans on terms suitable to them and by teaching them a few sound financial principles so they could help themselves. A Social business as defined by Prof. Yunus is an innovative approach to tackle the big social and environmental challenges of our times. It is a powerful tool to create a world of three zeros: zero poverty, zero unemployment and zero net carbon emissions. Social business is a sustainable business whose purpose is to serve a societal cause. In a social business, the investors/shareholders can gradually recoup the money invested, but accept not to take any dividend beyond that point. Purpose of the investment is purely to achieve one or more social objectives through the operations of the company, no personal gain is searched by the investors. The impact of the business on people or environment, rather the amount of profit made in a given period, measures the success of social business. 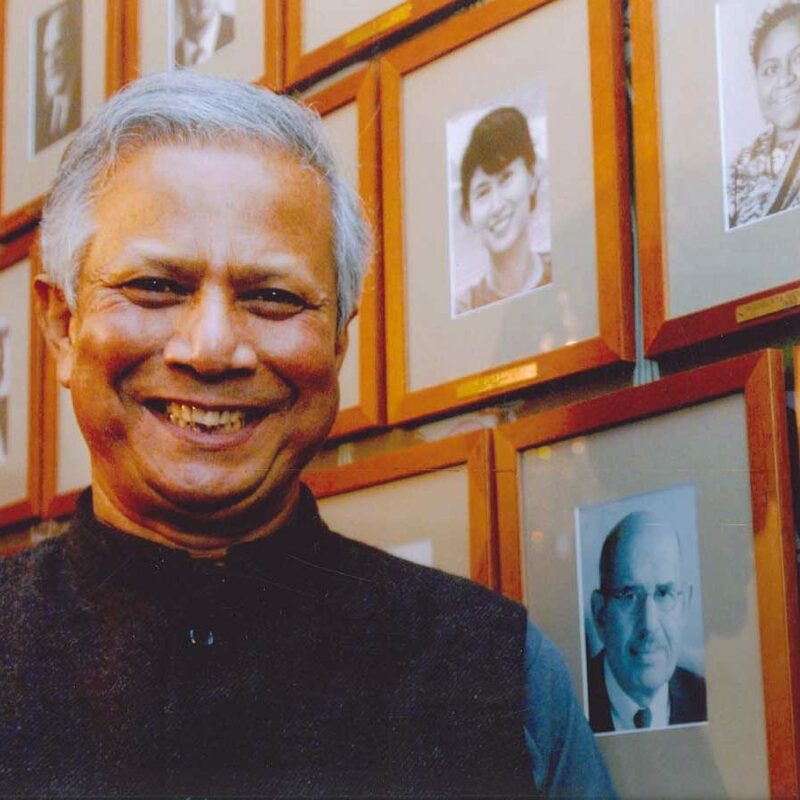 The inspirational story of how Nobel Prize winner Muhammad Yunus invented microcredit, founded the Grameen Bank and transformed the fortunes of millions of poor people around the world. 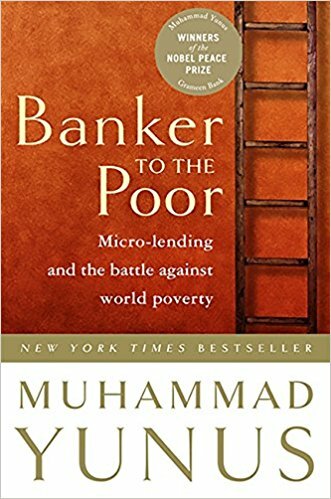 Muhammad Yunus was a professor of economics in Bangladesh, who realized that the most impoverished members of his community were systematically neglected by the banking system -- no one would loan them any money. Yunus conceived of a new form of banking -- microcredit -- that would offer very small loans to the poorest people without collateral, and teach them how to manage and use their loans to create successful small businesses. He founded Grameen Bank based on the belief that credit is a basic human right, not the privilege of a fortunate few, and it now provides $24 billion of micro-loans to more than nine million families. Ninety-seven percent of its clients are women, and repayment rates are over 90 percent. Outside of Bangladesh, micro-lending programs inspired by Grameen have blossomed, and serve hundreds of millions of people around the world. In the last two decades, free markets have swept the globe, bringing with them enormous potential for positive change. But traditional capitalism cannot solve problems like inequality and poverty, because it is hampered by a narrow view of human nature in which people are one-dimensional beings concerned only with profit. In fact, human beings have many other drives and passions, including the spiritual, the social, and the altruistic. Welcome to the world of social business, where the creative vision of the entrepreneur is applied to today's most serious problems: feeding the poor, housing the homeless, healing the sick, and protecting the planet. 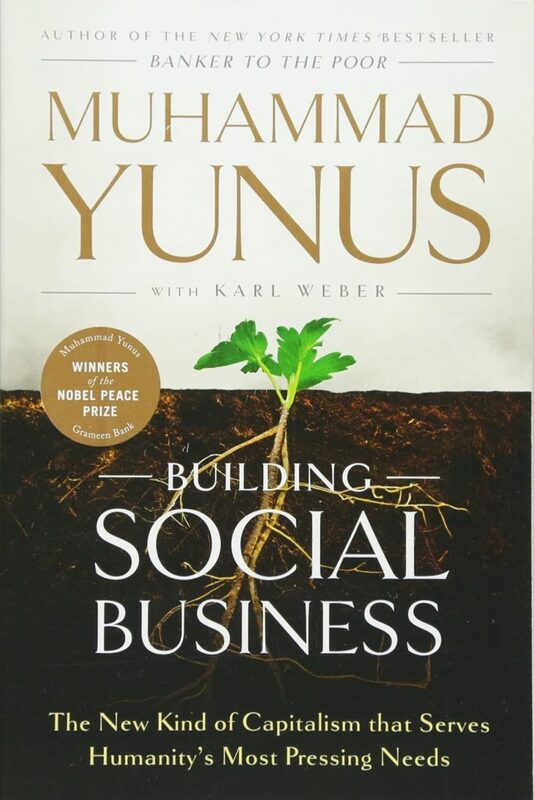 This third book by Professor Yunus, following 'Banker to the poor and creating a World Without Poverty', is dedicated solely towards the concept of social business, its implementation, and its maintenance. 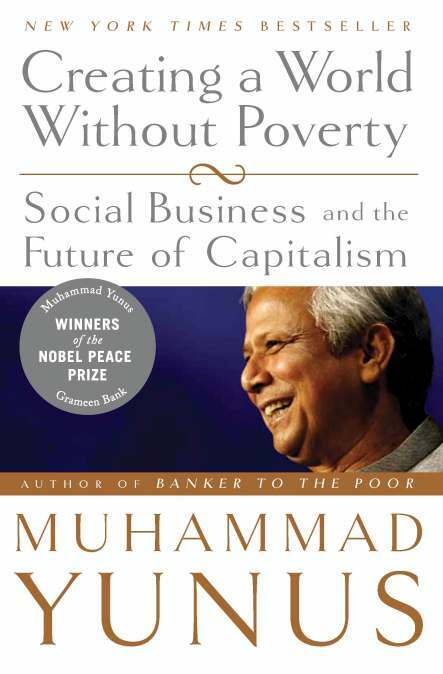 Muhammad Yunus, the practical visionary who pioneered microcredit and, with his Grameen Bank, won the 2006 Nobel Peace Prize, has developed a visionary new dimension for capitalism which he calls “social business.” By harnessing the energy of profit-making to the objective of fulfilling human needs, social business creates self-supporting, viable commercial enterprises that generate economic growth even as they produce goods and services that make the world a better place.In this book, Yunus shows how social business has gone from being a theory to an inspiring practice, adopted by leading corporations, entrepreneurs, and social activists across Asia, South America, Europe and the US. He demonstrates how social business transforms lives; offers practical guidance for those who want to create social businesses of their own; explains how public and corporate policies must adapt to make room for the social business model; and shows why social business holds the potential to redeem the failed promise of free-market enterprise. 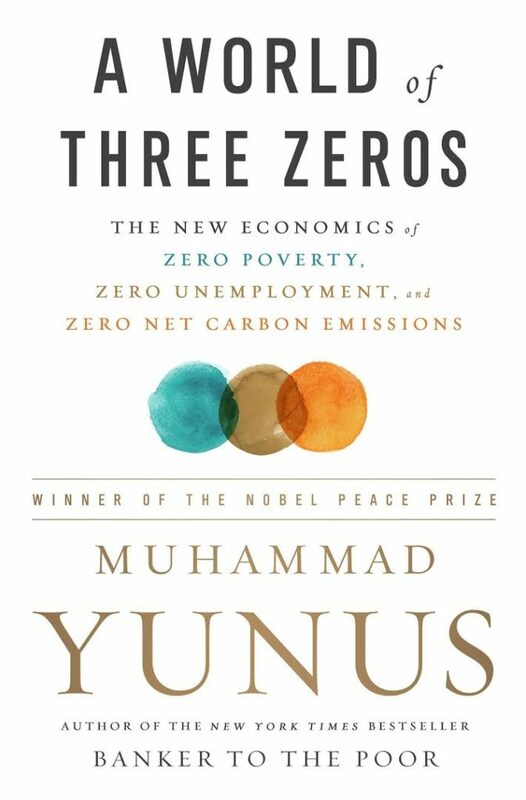 in his book A World of Three Zeros, Yunus advocates rethinking the basic tenets of capitalism, given that poverty and unemployment demean so many, and that climate change threatens so much. The Nobel Peace Prize winner, known for his creative solutions to alleviating poverty, questions Adam Smith’s assumption that a “human being is basically a personal-gain-seeking being” and asks us to consider the social dimension to the decisions and investments we make. He lays out a new framework, supported by his own successful economic experiments, for better tapping human capital to solve the world’s problems. The Yunus Centre Paris is the first Yunus Centre outside of Dhaka, founded by Nobel Peace Prize laureate Prof. Muhammad Yunus. Nous n’avons pas d’opportunité pour le moment mais n’hésitez pas à nous envoyer une candidature spontanée. We don’t have opportunities for now but don’t hesitate to send an open application.